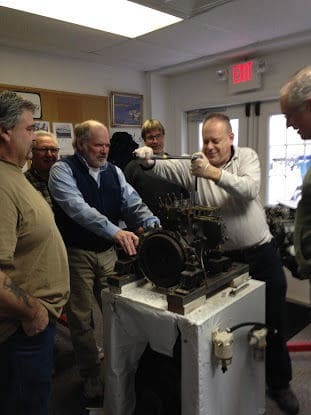 This course covers the diesel engine. This is a small, hands-on course. Since we will be clustered around the motor with tools in hand, we limit the class to five students. When you arrive you will find a diesel motor completely disassembled with an intact block, and all the other parts arranged on several tables. A diesel has six systems: fuel, raw water, fresh water, air, oil, and electric. If any one of them malfunctions you will be without an engine. You and your classmates assemble the engine system by system understanding the purpose of each part and the symptoms if a part fails. After we finish assembling the engine, you will KNOW what makes a diesel go, and if it stops what system to go to to get it going again. Then we apply what you learn by going to a boat in the water with a working diesel engine and cause it to fail, so we can get it going again. This course will not turn you into a diesel mechanic, but it will give you the knowledge to diagnose the normal things (almost always fuel problem or overheating) that cause a diesel to fail, and know if you can fix it or if it is serious enough to call in a mechanic. You will also learn how to winterize your diesel and do the spring commissioning on the motor. Special Package Pricing for Diesel, Boat Systems and Marine Electrical 15% OFF when all three are paid and taken in the same year. FIVE DAY Diesel/Boat System-spring commissioning and fall decommissioning of boats.